Although the Commonwealth of Massachusetts is legally committed to complete the Green Line Extension by 2014, the Massachusetts Department of Transportation and the MBTA announced on August 22, 2011 that the project will be delayed until 2018 or even 2020. Somerville leaders and citizens have reacted with frustration after yet another delay. According to The Boston Globe: "The Board of Aldermen passed a resolution last night calling for top state transportation officials to appear before it to answer for the recent delay of the Green Line extension project and urged the city's mayor to explore renewing legal action against the Commonwealth." In the early 20th century Somerville had extensive rail service. Streetcars serviced the major squares and ran along the main streets such as Highland Avenue, Somerville Avenue, and Broadway. Buses eventually replaced the streetcar lines in the mid-20th century. Until the opening of the Davis Square station in the early 1980s, Somerville had no passenger rail service. The extension of the Green Line through Somerville has been a very long time coming. In fact, there is a map from 1945 showing a proposed rapid transit route from Lechmere to Woburn. 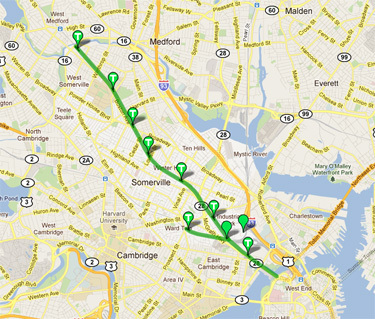 Studies in 1962, 1973, and 1981 evaluated transit options from Lechmere Station into Somerville. In the early 1990s, as mitigation for the Big Dig, The Commonwealth of Massachusetts committed to implementing the Green Line extension. In 2005 the Conservation Law foundation sued the state to force it to live up to its commitment. As a result the state agreed to complete the project by 2011. This date was then pushed backed to 2014.